This paper is the second of a series examining the use of nutritional supplements as chemopreventive agents. The first paper in the series examined the data from human chemoprevention trials. In the present paper the mechanisms of action of promising treatments will be discussed. In vitro and animal data are presented in support of the agents as appropriate. The subject of chemoprevention with nutritional agents has been the subject of voluminous research, and this review should not be considered exhaustive. In cases where review articles already exist regarding a particular agent (e.g., vitamin A, beta-carotene), these papers should be consulted for a more complete summary. The data presented in this review will focus on three common tumor types: breast, prostate, and colon cancers. While data are available regarding prevention of other tumor types, it is not as extensive as the data covered in this paper. It is the opinion of the authors that agents with a clear record of safety in human studies, evidence of chemoprevention in animal studies, and well-understood mechanisms of action, should be considered for clinical use pending results of large human trials. Vitamin A is obtained from the diet in the form of retinyl esters, which are subsequently de-esterified to retinol. Retinol is then irreversibly oxidized to become retinoic acid. Retinoic acid is the form of vitamin A that binds with nuclear receptor sites and is necessary for the normal growth and differentiation of epithelial tissue. The effects of vitamin A on cellular differentiation are mediated by two separate classes of nuclear receptors, which in turn modify the effects of many compounds, including prostaglandins, vitamin D, and steroid and thyroid hormones. Many studies have examined the effects of isomers of vitamin A, including all-trans retinoic acid, 9-cis retinoic acid, and 13-cis retinoic acid. These isomers are all considered to be interconverted in humans, and may be less hepatotoxic than retinol. Although the preclinical data have been promising, human studies using vitamin A or retinoids as chemopreventive agents have been largely disappointing. It appears likely from the epidemiological data that the protective effect of retinoids is limited to those who are deficient in dietary vitamin A. It is also possible that the effect is limited to particular clinical situations (e.g., bladder cancer, premenopausal breast cancer). Carotenoids are a family of conjugated polyene molecules found largely in fruits and vegetables. Carotenoids are antioxidant, and certain carotenoids can serve as precursors to retinol in humans. Of the more than 600 carotenoids, beta carotene and lycopene have generated the most attention in the chemoprevention field. As discussed in the first paper in this series,  beta carotene has been extensively studied in human trials as a chemopreventive agent. In contrast to the human data, which have largely found beta carotene supplementation to be associated with either no change or an increase in cancer risk, epidemiological evidence has very strongly associated beta carotene intake with reduction in the risk of cancer of many different types. Several schools of thought exist regarding the discrepancy between epidemiology and human experimental data. The first is that the human studies that used synthetic beta carotene may not have used the right nutrient mixture for chemoprevention. Animal  and preliminary human research  have shown mixed carotenes have a better chemopreventive action than synthetic beta carotene. Secondly, it has been theorized that beta carotene may have a pro-oxidant effect in vivo,  an effect that could potentially be carcinogenic. These two theories are not mutually exclusive, and it is possible both are true to some extent. Epidemiological studies have correlated both high intake  and high serum concentrations  of lycopene with reduced risk of prostate cancer. High adipose concentrations of lycopene have been associated with a reduced risk of breast cancer. Lycopene has been shown to inhibit cancer cell growth in vitro, including prostate,  breast,  and lung  cancer cell lines. Animal studies have shown lycopene inhibited development of mammary  and colon  tumors. Like folic acid, deficiency of vitamin B12 can lead to hypomethylation of DNA.24 A role for vitamin B12 in the process of carcinogenesis has been theorized since 1954, when abnormal cell types were found in the stomach lining of patients with pernicious anemia. Women in the lowest quartile of serum vitamin B12 have been found to be at increased risk of developing breast cancer in a prospective, epidemiological study. High mean corpuscular volume (MCV), which is often a sign of either vitamin B12 or folate deficiency, has been found to be predictive for a risk of colorectal polyps in men. Vitamin B12 treatment, together with folic acid, has been shown to reverse a precancerous condition of the lung called squamous metaplasia1,  but has not been used in primary prevention trials to date. Since vitamin C is a potent water-soluble antioxidant, it has generated interest as a potential cancer preventive compound. Vitamin C is necessary for the recycling of glutathione, another endogenous antioxidant. It has been theorized to protect against the ability of cancer cells to invade tissue, in part by strengthening the cellular matrix. Vitamin C is directly cytotoxic to certain cancer cell lines in vitro. This toxicity can be reversed by the addition of the enzyme catalase into the medium, suggesting that the cell-killing effect of vitamin C is due to a production of hydrogen peroxide within the cell. For most cancers, however, the only information available regarding the chemopreventive activity of vitamin C is epidemiological research. Three of four intervention trials have found a significant benefit from vitamin C supplementation, often along with other interventions, in the treatment of colon polyp patients. In the first of these trials, administration of 3 g/day of vitamin C for nine months led to a significant reduction in polyp area in patients with polyposis coli compared to placebo. In a later trial, supplementation with 30,000 IU vitamin A palmitate, 70 mg d,l-alpha-tocopherol, and 1 g vitamin C per day for six months led to a statistically significant reduction in abnormal cell proliferation in patients with colorectal adenomas. Also, supplementation with 4 g/day vitamin C for four years, in addition to vitamin E (400 IU) and a fiber supplement (22 g/day) was associated with a reduction in polyps in patients with familial polyposis. In the negative trial, supplementation with 1 g/day vitamin C with 400 mg vitamin E for four years was not associated with reduced risk of recurrent colonic adenoma. While the data are not unanimous, evidence exists to support the possibility that oral vitamin C can help reduce the area, proliferation, and recurrence of precancerous colon lesions. Vitamin D has been shown to reduce the proliferation of many tumor cell lines in vitro, including breast,  prostate,  and colon. Treatment of animals with synthetic vitamin D analogues has been shown to inhibit metastasis and prolong survival time in breast cancer models. Vitamin D has been shown to inhibit the development of colon tumors in animals, an effect the authors attributed partially to angiogenesis inhibition. Treatment of men having recurrent prostate cancer with between 0.5 and 2.5 mcg of oral calcitriol at bedtime (hypercalcemia was the dose-limiting side effect) caused a significant slowing of the rate of prostate specific antigen (PSA) increase compared to pretreatment levels in six of seven patients. In the seventh patient, a non-significant trend toward reduction in the rate of PSA elevation was noted. In another preliminary study, 44 percent of patients with hormone-refractory advanced prostate cancer and bone metastases were found to have low serum concentrations of vitamin D.  In this trial, supplementation with 2000 IU vitamin D2 was associated with reduced bone pain and improved quality of life from baseline. Several human intervention trials have examined the ability of vitamin E to prevent carcinogenesis. Vitamin E, often as part of a larger nutritional protocol, has been found to significantly reduce incidence of prostate, bladder, and stomach cancers, as well as to prevent recurrence of colonic adenomas in some, but not all studies.1 Both the Women's Health Study  and the Physician's Health Study II  are ongoing clinical trials with large patient populations following up on the promising results of the preliminary vitamin E chemoprevention trials. High calcium concentrations in drinking water have been correlated with a significantly reduced risk of developing breast cancer,  but not prostate cancer  in Taiwan. Animal studies have not yet clarified a role for calcium in breast and prostate cancer prevention. 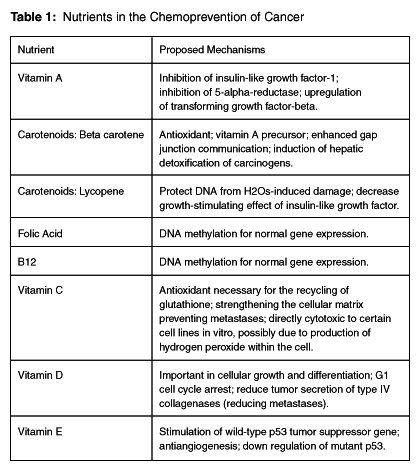 Table 1 summarizes the cancer preventive potential of vitamins and minerals. Coenzyme Q10 (CoQ10) is a lipid-soluble antioxidant involved in the production of ATP via the electron transport chain. Tumor tissue levels of this nutrient have been found to be significantly lower in breast cancers than in surrounding normal tissue.8  A series of preliminary reports suggest a potent treatment effect of CoQ10 in advanced breast cancer. [90,91] These reports have methodological flaws that make them difficult to interpret, however. An unpublished human trial found CoQ10 treatment to cause regression of prostate tumors, as well. Colon cancer tissue contains significantly higher levels of CoQ10 than surrounding tissues, for reasons that are unclear. Future animal and human studies will need to elucidate the role of CoQ10 in prevention and treatment of cancers.